7 May was the 152nd anniversary of the birth of the Bengali creative genius and philosopher Rabindranath Tagore. This year is also the centenary of Tagore winning the Nobel Prize for Literature. 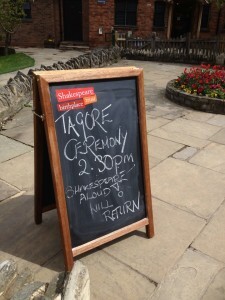 We celebrated the occasion at Shakespeare’s Birthplace on Saturday afternoon, two weeks after the Shakespeare birthday celebrations. I outlined the connection between the two Bards and presented the programme for the afternoon in my blog post last week. 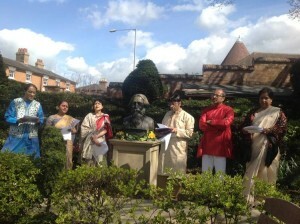 The annual tradition of celebrating Tagore’s birth anniversary by the bust in the garden of Shakespeare’s Birthplace was started by my parents and their Bengali cultural group Prantik in 1997, the year after the bust was installed in the garden. 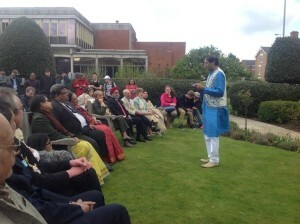 After a break for tea and a chance to look at the Tagore section of the ‘Shakespeare Treasures’ exhibition, HE Mohamed Mijarul Quayes launched the CD collection of all 2,222 songs in Tagore’s Gitobitan (the compendium of his songs) and presented a framed portrait of Tagore to the Shakespeare Birthplace. He then gave this excellent introduction to the UK premiere of our film version of Chitrangada. 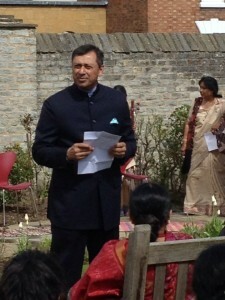 In his introduction, the High Commissioner also mentioned the other two dance-dramas by Tagore: Chandalika and Shyama. Our film versions of these dance-dramas had their world premieres in Stratford in 2011 and 2009, respectively. Chitrangada completes the Tagore dance film trilogy.